The Book Rat: GIVEAWAY: The Dashwoods Card Set from The Antique Fashionista! GIVEAWAY: The Dashwoods Card Set from The Antique Fashionista! Today we have another lovely giveaway from The Antique Fashionista, Masha Laurence! This time we have on offer these two beautiful cards of Elinor and Marianne Dashwood, surrounded by quotes pertaining to their characters. Want 'em? All you have to do is fill out this form, and stop by Masha's Etsy shop and tell me your favorite piece! Those are fantastic! 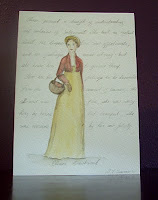 I love the dress on Margaret Hale and Fanny Price. 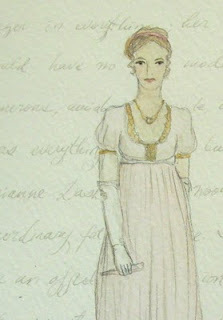 (my friend hand makes dresses like these) But the Darcy and Elizabeth ones are my favorite. Yah! I'm off to check it out.